I have (actually – I had!) an obsession for keeping the house organized and clutter free. Nothing was to be left outside, everything was to be pushed inside the already bulging almarahs. Only the dining table and the sofa set is tolerated in the hall. That too because these cannot be shoved inside a wardrobe, else I might have tried! The news paper left in the table for a moment, the car my son was playing with or the towel left in the chair for a second – everything goes inside the minute I see it. But the wardrobes are messy. Really messy! I am fine as long as the mess is inside and cleaned periodically. Like my messy wardrobe, my bookmarks folder too has grown really long and messy. I was cleaning up the list, when I came across this Paal Pidi recipe from Ramya’s space. It fitted perfectly into the ‘Something Sweet’ theme for this week’s Blogging Marathon and so here it is. One link off the bookmark list and only a thousand more to go! Boil water with a pinch of salt. Pour it into the rice flour little by little, mixing with a spoon as you go. Once it all comes together, kneed for a minute to get a soft dough. Its the same as the one for Ela Ada. Take a small pinch of this dough, no more big than the size of a cherry, and roll into a small ball. Repeat until the rice flour dough is used up. Steam these pidi in an idli cooker for 10 – 15 minutes, till they are cooked through. If the balls are big, it may not cook in the middle, so keep the size of the pidi small. In a wide thick bottomed pan, mix coconut milk, sugar and whole milk together and bring to a boil. Add the steamed pidi into it and and let it boil for 10-15 minutes till it thickens a bit. Taste in between and add more sugar if required. Add half a tsp of cardamom powder, if desired and serve hot or cold, decorated with nuts. 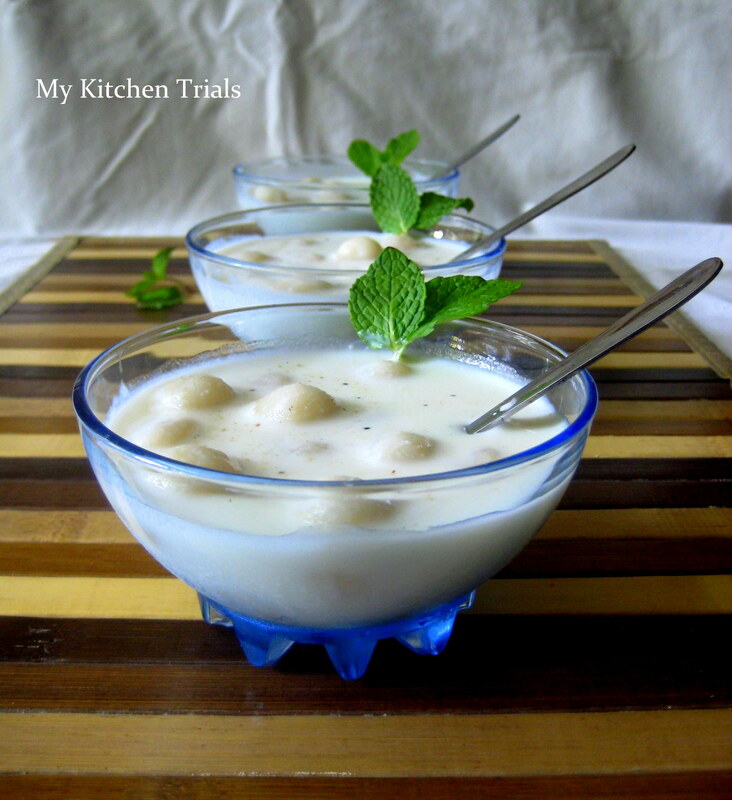 You can make this with coconut milk or whole milk alone or use a combination of both. LOL on cluster free..:)..paal pidi looks great..
i have sudden attacks for the ‘cluster free’ moments! :) the payasam looks delicious! and super presentation! I like this recipe..have eaten it many times..never tried before. Time I make my own. 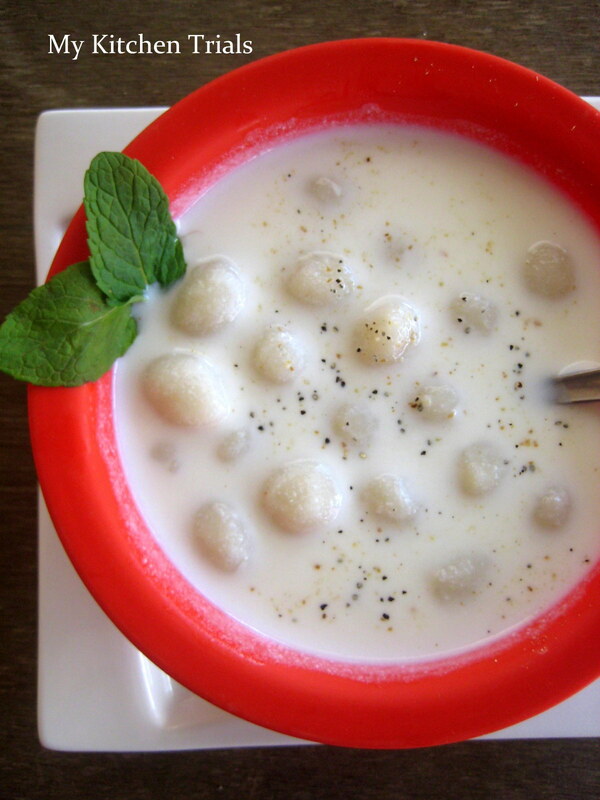 Paal pidi looks tempting and delicious,wonder presentation and clicks…. 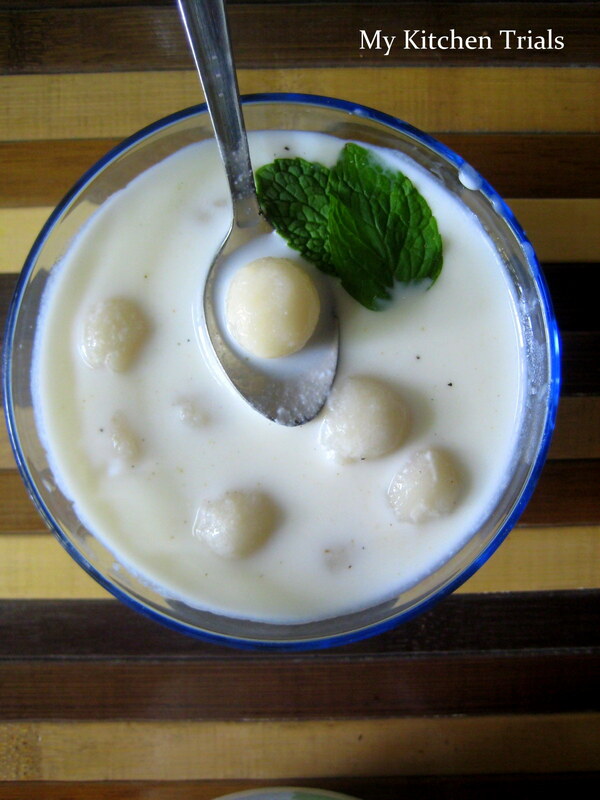 These look soo cute..like mini rasgullas…never tasted this before…seems I need to take a trip to South and eat some authentic south ka food. Im glad you liked it…Your clicks are awesome..Its been a long time I made it…makes me crave now..
Beautiful picture and that bowl looks so inviting..
Just love this paal pidi,one of my fav anytime. LoL. I hate cleaning up and here you are..an anti-thesis of me. We have something in common though..I have bookmarked plenty and like you I think I have 1001 more to go or something..
Anyways, great looking sweet dish. It sort of resembles the Paal Kozhukattai! Lovely and tempting paal pidi. Love it. We have something similar in Andhra, only difference being the rice flour is shaped in strings instead of tiny balls. I have seen quite a few recipes of this dessert but am yet to taste it. Wow..that’s a awesome clicks..Loving it.